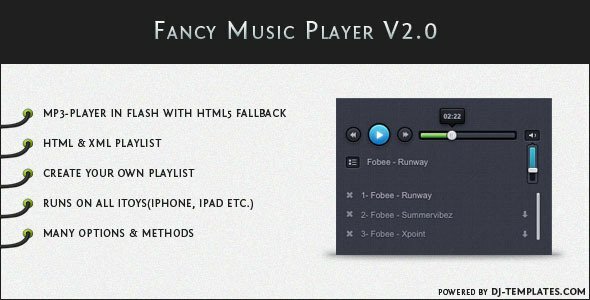 It’s one of my favorited jQuery Media Player plugins with Responsive and Touch-Friendly. This plugin has ability to conveniently uses Flash Player for non-HTML5 browsers when necessary. Compatible with iOS, Android, and Desktop Browsers. Conveniently uses Flash Player for non-HTML5 browsers when necessary. Protect your audio from being hijacked by using a beep overlay, or another overlay sound. Auto fallback to Flash in Firefox if not using .ogg files. A circular progress meter displays playback position & time remaining. Easily customize the color of the progress meter. 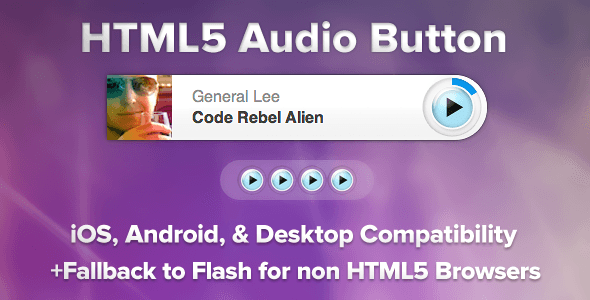 HTML5 Audio Buttons are smart, and stop playback when another button starts playmode. Set a default size, and/or use custom dimensions for each button to support multiple layouts, and designs on the same page. Easily customize the play & pause images. 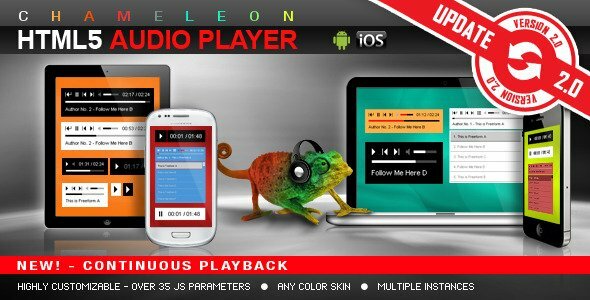 Universal HTML5 Audio Player is not free, but it’s very cheap with just $6. First it detects if HTML5 Audio is supported, if not a hidden Flash File (swf) will be used to play the tracks. It also detects when you add track to the playlist and a track with the same title already exists, then the existing track will be selected. A jQuery plugin that replaces <audio> element with a little of custom HTML code. By adding some CSS you get a whole new player which looks the way you want and has the same functionality as the default player. There is no direct way to style the element. But the HTML5 DOM has methods, properties, and events for the element and thus makes it quite easily manipulable. I used it for many projects as default audio player. HTML5 <audio> or <video> player with Flash and Silverlight shims that mimics the HTML5 MediaElement API, enabling a consistent UI in all browsers. Many great HTML5 players have a completely separate Flash UI in fallback mode, but MediaElementPlayer.js uses the same HTML/CSS for all players. The jQuery Media Plugin supports unobtrusive conversion of standard markup into rich media content. It can be used to embed virtually any media type, including Flash, Quicktime, Windows Media Player, Real Player, MP3, Silverlight, PDF and more, into a web page. The plugin converts an element (usually an <a>) into a <div> which holds the object, embed or iframe tags neccessary to render the media content. 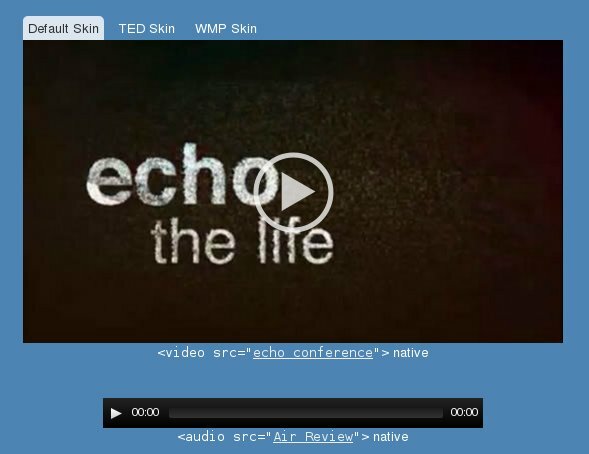 The html5media project makes embedding video or audio as easy as it was meant to be. It’s a fire-and-forget solution, and doesn’t require installing any files on your server. 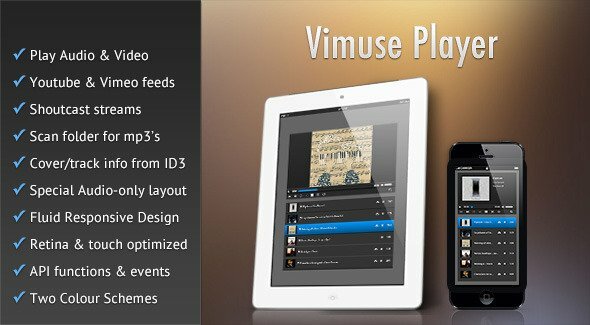 Unlike many other HTML5 video players, it allows people to use the video controls supplied by their own web browser. It’s one of the smallest, fastest solutions available, and as browser technology improves it will become even faster. Build playlist by scanning folder for mp3 files. Player API functions and events. 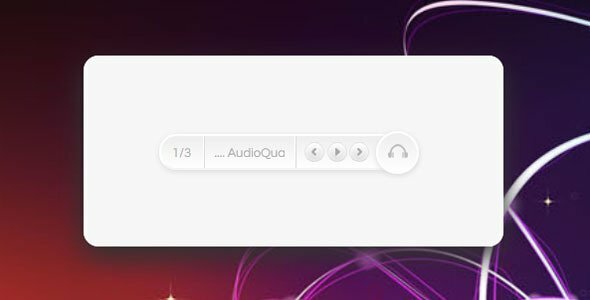 This HTML5 music player is great for anyone who needs their music to work on both desktops and mobile devices. It has three CSS3 based skins to choose from and comes with a custom built Flash fallback for older browsers that don’t support HTML5 Audio. Use it as your page’s main music player, add it to your blog posts or build on top of it with the available API methods. 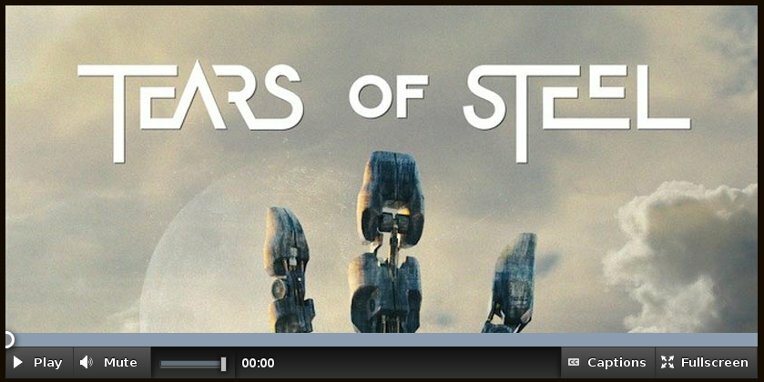 The player is custom built on top of jQuery 1.10.2 and is void of any external open source media plugins (keeping it super-optimized and light-weight). Showcase your music with style. 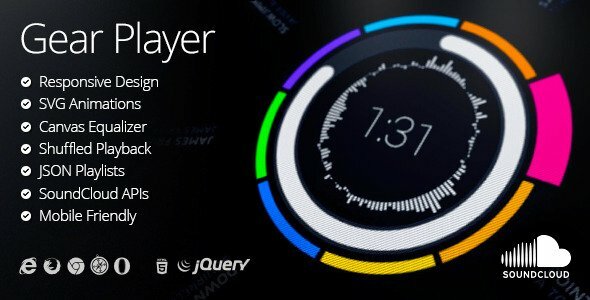 Gear Player provides a never seen user interface that will engage everybody. 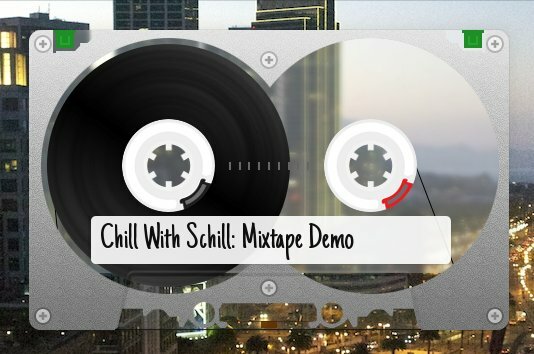 It pushes HTML5 to its limits with smooth SVG animations, an unique Canvas equalizer and SoundCloud support. Acorn Media Player is built with accessibility in mind. It provides full keyboard access using standard tab-based navigation, screen-reader (and other AT) support, accessible themes, and other accessibility tweaks. This is no native support for closed captioning on HTML5 <video width="300" height="150"> yet, but that shouldn’t stop you from providing them. It supports external SRT files just like desktop media players. Along with closed captions support, the player provides a dynamic transcript generated from the selected captions. Supporting HTML5 audio can be tedious in modern browsers, let alone legacy ones. With real-world visitors using browsers ranging from mobile Safari to IE 6 across a wide range of devices, there can be many support cases to consider. Despite being one of the senses, sound has largely been missing from the web due to inconsistent technology support. SoundManager 2 bridges this gap, making it easier to use audio across a growing variety of devices and platforms, both desktop and mobile. The Apple Lossless Audio Codec (ALAC) is an audio codec developed by Apple and included in the original iPod. ALAC is a data compression method which reduces the size of audio files with no loss of information. A decoded ALAC stream is bit-for-bit identical to the original uncompressed audio file. The original encoder and decoder were open sourced by Apple, and this is a port of the decoder to CoffeeScript so that ALAC files can be played in the browser. MediaBox is a jQuery plugin that helps you create multimedia applications very quickly. 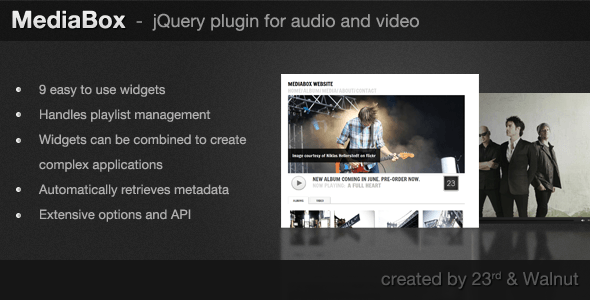 MediaBox leverages the power of jQuery and jPlayer and utilizes HTML5 with a flash fallback. Handles all aspects of playlist management and automatically updates all active widgets if the playlist changes. Includes an API that exposes all functionality in a developer friendly manner. Can you please help me out how to set a continuous songs list in WordPress. Is there any good plugin for WordPress. I have get JSON data every time when I opened a website. based on the list of values the music player will play the songs list as order. Can you suggest any WordPress plugin is there for this or any custom integration code also. 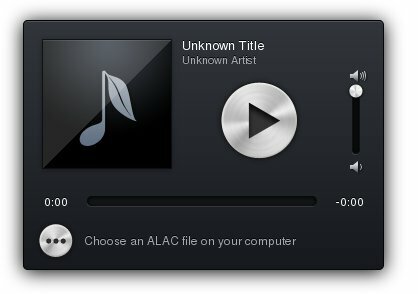 I prefer Sticky HTML5 Music Player With Continuous Playback as the player that you’ve looking for.